LEGO inspired tech takes your multimedia by storm - The "iBeamBLOCK" is a modular projection system consisting of HD projector, Windows 10 tablet and power bank. The single components are stacked together cordlessly and held together due to magnets and Pogo-Pins. Content can be projected via the 4.5" tablet with multi-touch LCD display which has an internal memory as well as a Wi-Fi, Bluetooth, USB, MicroUSB and MicroSD card interface. Due to an HDMI interface other end device can be connected. Particularly important for business usage: the compact projector displays Excel, Word, PowerPoint and PDF documents crystal clear with 400 lumens of brightness and an image diagonal of up to 120". iBeamBLOCK's modular design comes packed with everything (Wi-Fi, Bluetooth, USB, MicroUSB, MicroSD card, HDMI interface, etc.) you need to seamlessly go from a killer office presentation, to a personal entertainment power house. Plus it all connects (magnetically) without any cords! 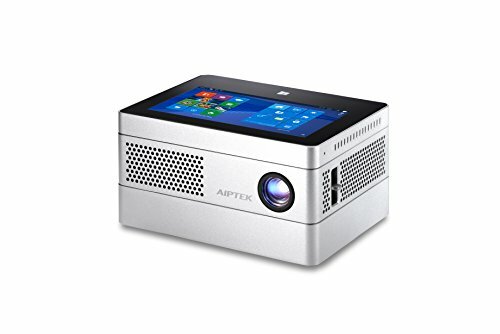 Crystal clear Projection - The bright HD (1280x720 Pixel) projector displays Excel, Word, PowerPoint and PDF documents crystal clear with 400 lumens of brightness, an image diagonal of up to 120" and a throw ratio of 1.2. Due to an HDMI interface the DLP projector with RGB LEDs can also be used as a standalone device. Reliable power bank ensures a cable free projection of up to 2 hours without an external power source. With 13,200 mAh battery capacity it can be used for Smartphone charging. If you have any questions about this product by Aiptek, contact us by completing and submitting the form below. If you are looking for a specif part number, please include it with your message.